Back by popular demand following huge success in 2017, the madcap murder mystery returns to The Watermill Theatre for a limited run. A high-energy musical whodunit, Murder For Two is a mystery with a twist. 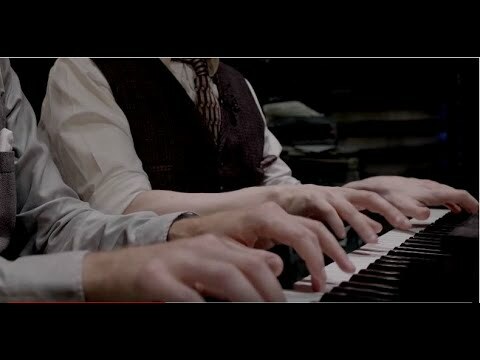 In this loving homage to the canon of murder mystery plays, two actors play thirteen characters... and the piano. A hysterical blend of music, murder and mayhem, Murder For Two thrilled audiences in 2017 during its UK premiere at The Watermill, before transferring to London. Theatre: Spider’s Web (Theatre Aquarius, Hamilton), The Last Party (Tarragon Theatre, Toronto); Crazy For You (Watermill Theatre); Grey Gardens (Southwark Playhouse); A Third (Finborough Theatre); Thérèse Raquin (Finborough Theatre/Park Theatre); Peter Pan (Richmond Theatre); Curtains (Landor Theatre – Offie Award nomination for Best Actor); The Canterbury Tales and Hamlet (on board Cunard’s Queen Mary 2); Wicked (Apollo Victoria Theatre); Dido, Queen of Carthage (Chapel of St Barnabus, Soho/Kensington Palace – Ian Charleson Award nomination); Peter Pan (Birmingham Rep); Beautiful Thing (Leicester Haymarket); Spring Awakening (Young Vic); Easter Parade workshop (ATG); The Snow Queen (Brewhouse Theatre); Who’s Afraid of the Big Bad Book? (Soho Theatre/ Warwick Arts Theatre); Gompers (Arcola Theatre); Oliver! (London Palladium); Peter Pan (Yvonne Arnaud Theatre). Film/TV: Murdoch Mysteries (CBC); The Umbrella Academy (Netflix); Canoe Man, Filth: The Mary Whitehouse Story, Hustle, Surviving Disaster, Hope and Glory (all BBC); Mike Bassett: Manager (ITV); Endgame (Evolution Films); The House on Arch Lane (Markenfilm). Jeremy composed the theme music to the TV mini-series Wimpole Street for Bolingbroke Productions. He can also be heard on the original London Cast recording of Thérèse Raquin. As Writer/Performer/Composer: Stack (Edinburgh Fringe Festival, DugOut Theatre); Swansong (Arcola Theatre/UK Tour, Dugout Theatre); Inheritance Blues, (Soho Theatre/West Yorkshire Playhouse/HighTide Festival/ ISDF); Fade (Edinburgh Fringe Festival, DugOut Theatre); HMS Ship (Edinburgh Fringe Festival, DugOut Theatre); Leeds Tealights (Edinburgh Fringe Festival). Ed is an Associate Artist of DugOut Theatre and won the Julian Slade Award at Bristol Old Vic Theatre School.